This past weekend, I had both a 70th birthday party and a bridal shower to attend. Instead of making my life easier and creating gifts from patterns I already had, I spent the week designing a brand-new apron and hand-cutting a stencil to etch a mason jar. But both guests of honor are totally worth it. I’ll tell you more about the apron another day. The birthday girl was the mom of one of our closest friends. 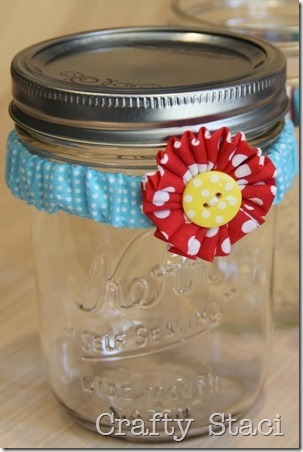 I decided to etch her name on a mason jar, making it a fun, personalized drinking glass. I’d love to show it to you, but unfortunately you can’t see the lettering in any of the photos I took before I wrapped it. The etching did turn out great, but it just needed a little something else to spice it up. This little scrunchie did the trick. 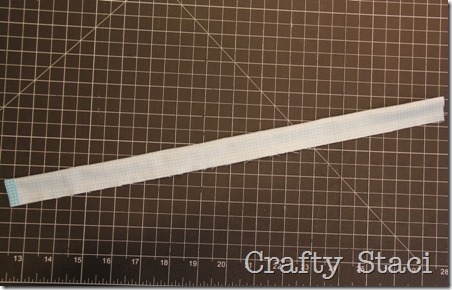 Fold one end of the band fabric under 1/4” and press. 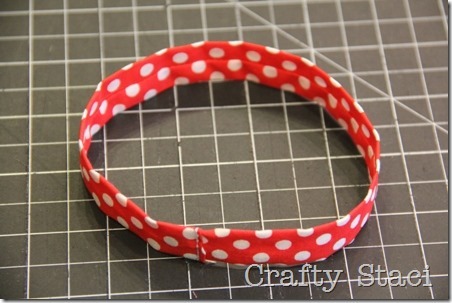 Fold right sides together and stitch a 1/4” seam down the side, leaving the ends open. Turn the tube right side out. Pin a large safety pin across one end of the elastic and pin another to the other end in the same direction as the elastic. Feed the elastic through the tube. 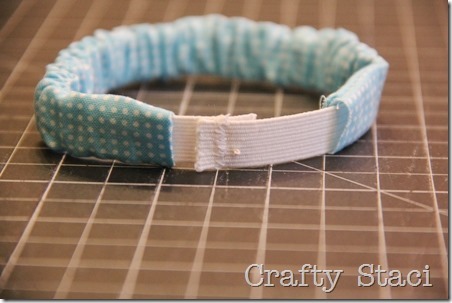 Overlap the ends of the elastic by 1/2” and stitch through both ends. Pull the fabric ends together. 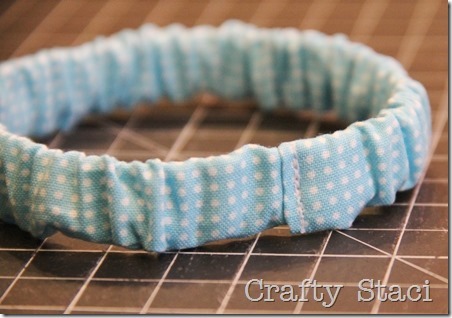 Push the raw end inside the folded end until they overlap by about 1/4”. Stitch through the fabric and elastic. Even out the gathers. To make the flower, turn one end of the flower fabric under 1/4” and press. With right sides together, stitch 1/4” from the long edge. Turn right side out. Press with the seam centered on one side. Bring the two ends together and slide the raw end inside the folded. Stitch. Hand stitch near one edge using long stitches and doubled thread. Pull the thread tight to gather into a flower. Knot the thread. 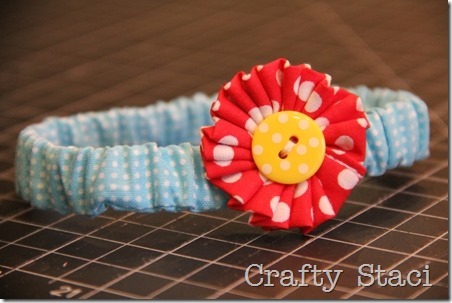 Stitch a button over the center of the flower onto the band. Be sure to catch some of the flower in the stitching so it doesn’t slip off over the button. 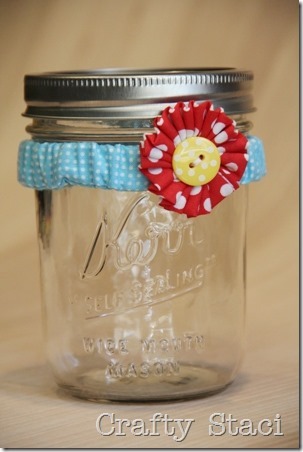 I can’t believe how this took a fairly basic glass from okay to cute gift!